Hi, I am interested in your 1990 Dodge Dakota 2WD Convertible (stock #19GKM32) listed on Autotrader for $14,900. I'd like to get more information about this vehicle and confirm its availability. One of 909 made! - Only 32k miles - 3.9L V6 - Factory Air - Recent Service - (Please note: If you happen to be viewing this vehicle on a website other than our main website, its possible that only some of our many photographs of this car are presented due to website limitations. To be sure you access all the photographs, please go to our main website: Garage Kept Motors.) 1990 Dodge Dakota Sport Convertible Garage Kept Motors is pleased to offer this rare and fun 1990 Dodge Pickup with a convertible top. Only 909 of these were made! Our client is a former Dodge dealer who sold this truck to a couple in 1994 with 76,000 miles on the clock. Over the past 25 years, they have only put 32,000 miles on it. They always kept up on maintenance and the truck was never driven in the winter - treated more like a convertible sports car. As shown today, the truck remains in excellent condition. From the factory, this Dakota Sport was finished in Bright White with factory original Gray graphics, a Black soft top, and Gray interior. It is powered by the original 3.9L/125hp FI V6 engine with an upgraded Automatic transmission (most came with manuals) and 2WD. At the time, the truck came loaded with power steering, power brakes, front disc brakes, power windows, power locks, tachometer, bigger V6 motor, and factory AC, which has been converted and blows cold. 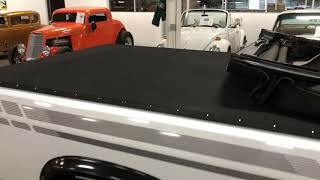 This cool little truck also comes with an aftermarket tonneau bed cover, boot cover for the soft top, original key, owners manual, books, and original Dakota Sport promotional booklet. The truck has just had a wheel cylinder replaced, new brakes, exhaust, oil change, and transmission service. It is even sporting period correct rubber on the original wheels. Clean CarFax report and a non-smoker. If youre in the market for something unique, this is an eye catcher and fun driver at a reasonable price point. MOPAR fan or not, theres something very cool about the Dakota Sport Convertible. Be sure to check out all the photos and video on our main website: Garage Kept Motors. Call if interested or e-mail with any questions. Thank you for looking.